You're either going to think ELLIS FAAS Light in Green Gold ($42) is as gaudy as it gets or extremely cool. I doubt there's an in-between. You'll either love it or think it's unwearable, and your skin tone will probably be a factor in your opinion. 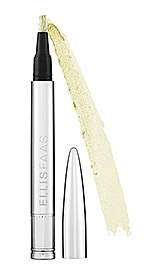 ELLIS FAAS Light in Green Gold (#E302) is "more than just a highlighter. This liquid color dries upon application and gives the illusion of having a small metallic sheet on the eyelid. Because the particles in the product are so fine, it will appear from a distance that the shiny texture is oily or wet, even though it dries to a perfectly smooth finish. You won't feel any stickiness on the eyelids, and the expert formula won't crease." Indeed, once it sets, its there for the duration, although I can't vouch for the "perfectly smooth finish." I have resisted ELLIS FAAS makeup until very recently. I'm not keen on campy makeup "systems," and that's how I saw ELLIS FAAS, with it's phallic pen holders. I'm a gold fan, though, so I had to order this green-gold color when I saw it at Sephora - just to check it out. As you can see, under the pen's cap, there's a brush, and you turn the base to drive the product up into its brush. I doubt if you will want to apply it - or blend it - using its own brush. It's impossibly hard to control. Without further ado, here are the swatch photos that will either send you running to Sephora online or running in the other direction. At the top of my arm, I applied a swatch straight from the tube. Below, I tried to blend out a dab with my fingers, clearly not doing a great job with an even application. It takes a precise brush to apply this color, and the one that comes with it does not fit that bill. ELLIS FAAS recommends that you use the brush to paint on the Light over any ELLIS FAAS eye shadow, even though it can also be used on its own. For the strongest effect of metallic intensity, let the Light dry where you have painted it on the eyelid. For a more subtle effect, dab it with your finger before the Light has dried completely. I found neither method satisfactory. If you try it, place a dab in your palm, apply it with a synthetic brush (like Bobbi Brown's touch-up brush), and work quickly. Color-wise, what you see here is what you get. It's an in-your-face color, gleaming like a gold bar with the kind of green antique patina that copper develops. It's as iridescent as a green glow stick. The best swatches of Light you'll find online are at the ELLIS FAAS Web site. That's where they say you can use the five shades of Light "in combination with Creamy or Milky Eyes to give infinite possibilities to play with shadow and light - exactly what applying makeup is all about." I'll withhold judgement on that. I recently purchased those too, but wasn't impressed with the colors (for once, I'm returning something). I doubt I'll wear Green Gold outside the house and may eventually give it away. It's too bold for my pale face. The color is intriguing, though, so it can stay awhile. What do you think? Is this a love it or leave it shade in your opinion? I got such a laugh out of this review. I think we've all had one of those experiences when curiosity got the better of us and we've ended up with a product that gets quickly passed on. I know I have :-) As for the actual packaging of Faas's line, I can't say I'm a fan. Although it looks sleek and modern, it's rather gimmicky and, in my experience, not the best delivery system. Beautiful colour, just stunning. I used to have a eye pencil in a similar colour and used it down to its last, nibby stumplet bit. I've enjoyed reading your comments on Green Gold. I got home late because I was out doing my "save the earth" volunteer work. It's so pretty! I'm really intrigued by the blood red lips, but I've had such bad luck with colicky pens that I flat out refuse to buy products sold that way anymore. I'm liking this shade! It's so different! I'd wear it! I have copper hair now so I think I'd like it! I have a couple of creamy eyes and really love them. They stay put on my oily lids and are great for a base as well. HATE the applicator though. I've heard that the applicators are pretty bad, from multiple bloggers and reviews; and I've pretty much decided that they're probably not worth the trouble--if I have to have a separate applicator for something that comes with an applicator...I just don't want to deal with it. Speaking of packaging...the two Edward Bess lipsticks in the old round metal tubes came today, along with a lovely hand-written note (and self portrait) from Edward himself! I have to agree with the views that the applicator is useless. For that kind of money, I expect more. It really comes down to color. Is the novelty worth the price? That is an atrocious color and shouldn't ever be manufactured. Maybe a 17 yr old club kid will look good in this. Thanks for reviewing this, you saved me some $$ that I can spend now on Chanel goodies at Nordstrom! Beautiful color, but the packaging is rather off-putting.